The Oststracoderms are a class of extinct fish. They were bony-armoured jawless fish, the Osteostraci ("bony shields"). They lived in what is now North America, Europe and Russia from the Middle Silurian to Upper Devonian. They were the first fish to use gills just for respiration. 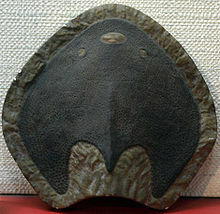 Ostracoderms were the first fossil fish to be discovered. They were found in the 1830s in the Old Red Sandstone of Scotland. The genus Cephalaspis is quite a common fossil in these rocks. This page was last changed on 25 February 2014, at 18:45.